Allen Street Construction is underway! The project team is working to accommodate businesses and customers as best possible. Signage has been installed to let people know that businesses are still open during construction, and signage includes the names of businesses that are open on impacted streets. Traffic obstruction and temporary road closures are being kept to as minimal disturbance as possible, and pedestrian access is being maintained. This information, as well as construction schedule, is available through the Allen Street Complete website. The City of Buffalo initiated the Allen Street Extension Project to design and construct infrastructure improvements that increase mobility, enhance economic vitality, and improve safety. 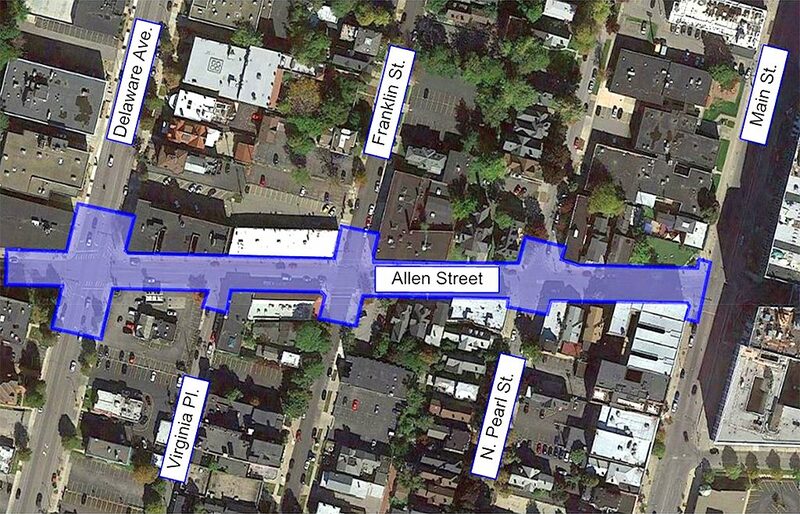 Phase I will include streetscape improvements on Allen Street between Main Street and Delaware Avenue. A future phase to complete construction on Allen Street is dependent on obtaining additional funding. The City of Buffalo retained Bergmann Associates, in conjunction with their partners Halvorson Design Partnership, Ravi Engineering, RK Hite & Co. and Highland Planning, to design the Allen Street Extension Project. The design phase was overseen by a Technical Advisory Committee with representatives from the City, Department of Public Works, Parks and Streets, the Mayor’s Office of Strategic Planning, New York State Department of Transportation, Buffalo Niagara Medical Campus, the Allentown Association and various other stakeholders within the Project area. The Project is now in the construction phase: Construction Inspection and Support led by Bergmann (sub-consultant Prudent Engineering) with Destro & Brothers Concrete Co. Inc. as the Prime Contractor (sub-contractors TBD).